I am an official ambassador for Dole Fresh Fruit and Fresh Vegetables. Dole provided me with compensation for my time. As always, all opinions expressed in this post are mine. 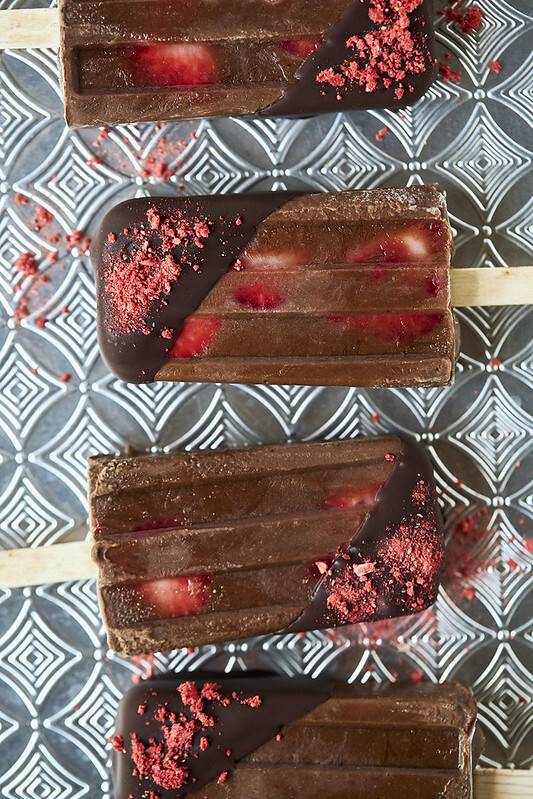 These Chocolate Covered Strawberry Fudgesicles are a fun and tasty way to encourage the kiddos to get more fruits and veggies. 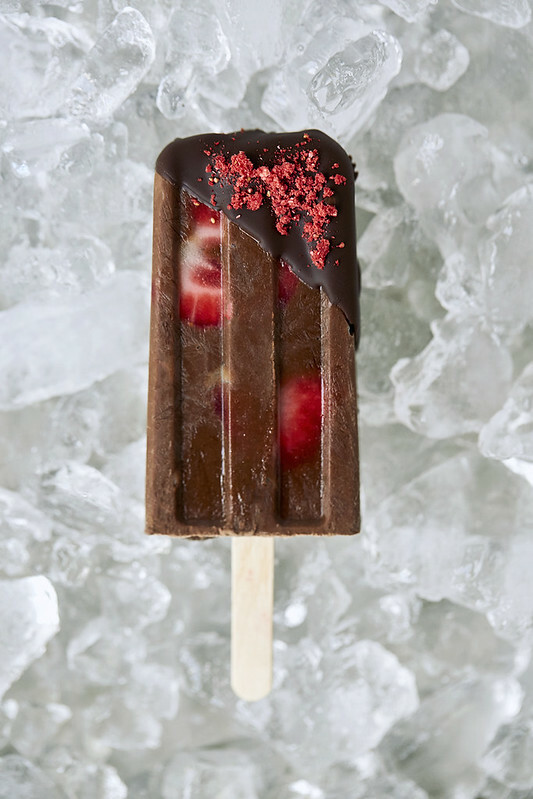 I would like to just go ahead and get this right out of the way – I added a veggie to your dessert and I am not sorry. I am going to just need for you to trust me on this one, until you make them yourself. I have never steered you wrong, have I? Let’s also discuss the idea of “sneaking” veggies in on kids. Listen, while I am an auntie to many, no, I don’t have my own kids, so I won’t pretend to understand the daily struggle of getting them to eat what you want them to. But I have borne witness to many of these altercations as a sidelined viewer. I do know that vegetables, especially, can be a contentious topic with the littles, that doesn’t always have an amicable resolution. But, while I don’t have my own children, I do work as a nutritional therapist with many adults. I see many, many iterations of various challenging habits and food aversions, lifelong unhealthy patterns, that often stem from childhood and not being led by example, not being taught, empowered and encouraged when it comes to making lasting, healthful choices. While I can appreciate the idea that just getting the veggies into your kids as being half the battle, I also very much feel like we have a wonderful privilege and obligation to teach our children about food and their health, rather than just playing tricks or sneaking it in on them when they aren’t looking. This accomplishes very little for the long run. It’s so important that we are teaching them HOW to make better choices and WHY it is so important as a lifelong practice. 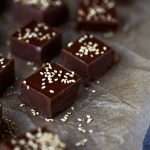 If we can show them how and encourage them to get creative with their food, but to also know the reasons why we should want to include certain nutrient-dense foods in our diets, not only will they possibly be more apt to want to include them, but we have to assume we are arming them with better habits for a lifetime of making more mindful and healthful choices for themselves and their own future families. My intent with this recipe isn’t to sneak veggies and fruit on your children, but rather, to make it easier and hopefully, more fun for all. 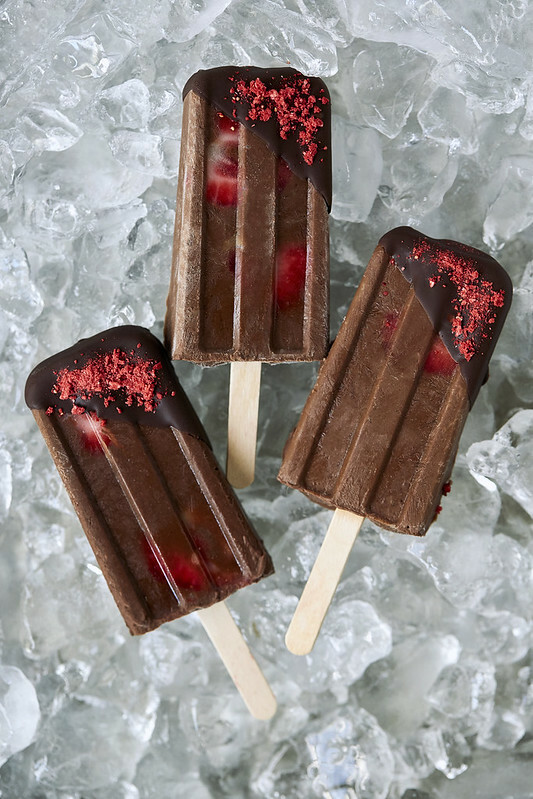 Try it, give them a this sweet, creamy fudgesicle and while they are enjoying it, likely ‘oohing and ahhhing’, tell them just what’s in there. Tell them why veggies are important to our growth and vitality, that we need them to build strong bodies and minds. Share that fruit and veggies provide us with loads of protective vitamins, minerals and antioxidants and just how important healthy fats are in a balanced diet. 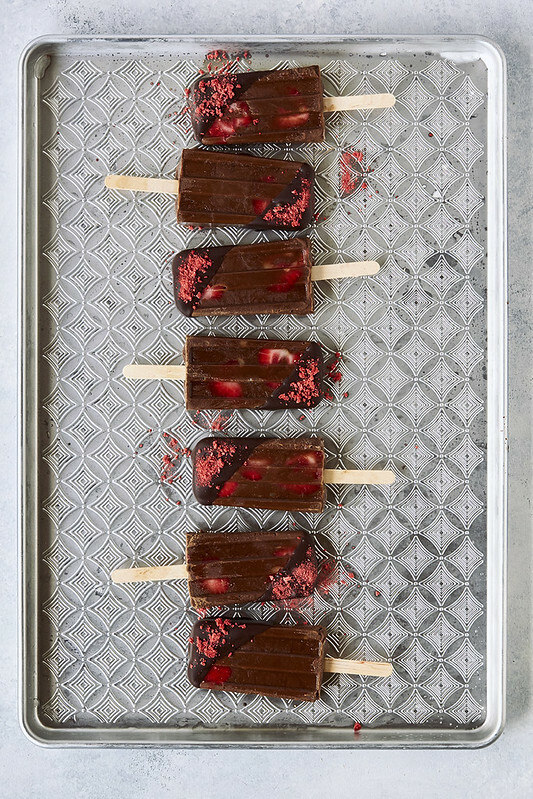 Maybe the next time you make these Chocolate Covered Strawberry Fudgesicles, have your children help you make them, it’s such a simple and fun recipe. Ask if they have any creative ideas of their own to include more fruit and vegetables in their diet. Include them in the process, empower and encourage them to want to make better choices, to get creative and feel informed! 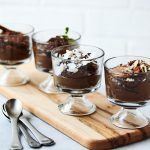 In addition to this recipe I am super excited to share that this week there’s another fun way to involve the kiddos in making more healthful food choices. This Thursday, May 25 is National Eat More Fruits and Vegetables Day (#FruitsAndVeggiesDay) and this is the also the day that Dole and Disney are collaborating together to kick off Fuel Up with Dole. Inspired by Disney●Pixar’s Cars 3 arriving in theaters June 16, Fuel Up with Dole features road-tested character recipes like this “Romaine Mandarin Oranges and Avocado Salad” (inspired by Miss Fritter), vacation nutrition tips, a family photo contest with prizes and other fun activities. Plus you’ll find Cars 3 characters on DOLE fruit and vegetables at your local supermarkets. A highlight is the “Fuel Up with Dole Ultimate Family Road Trip Contest” that asks family road warriors to submit their best healthy vacation photos for an opportunity to win one of 21 prizes including a customized 10-day RV road trip across the U.S. and Canada. Head over and check out all the tour dates and fun, get yourself entered in the contest and check out the delicious and healthy recipes to get your engine started! Steam the cauliflower florets until just tender. Drain in a colander and rinse with cold water to stop the cooking. 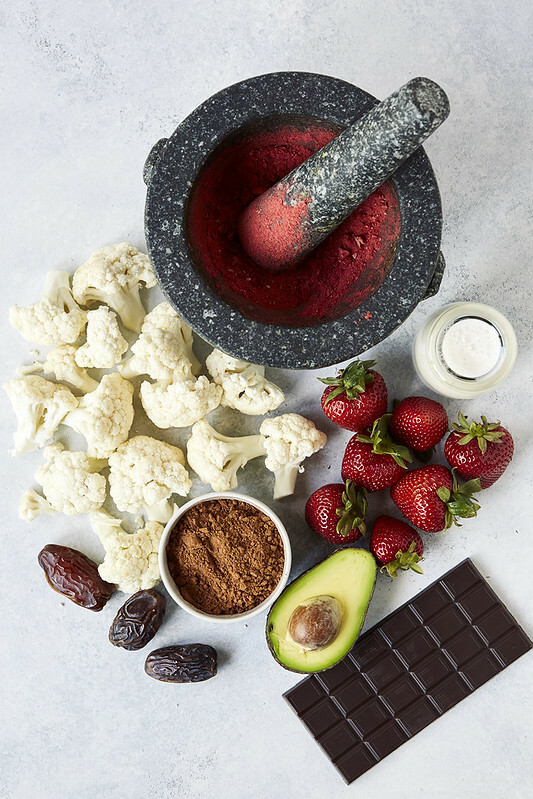 Add the cooked cauliflower, dates, avocado, cocoa powder, milk and sea salt in a high speed blender. Blend on high until super smooth and creamy, stopping to scrape down the sides, as necessary. Taste and adjust sweetness, as needed. 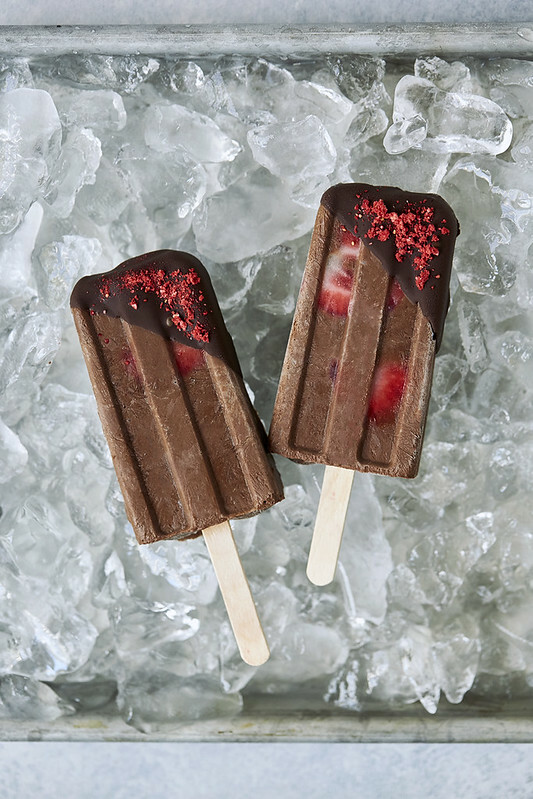 Add some of the sliced strawberries to each of the popsicle molds. 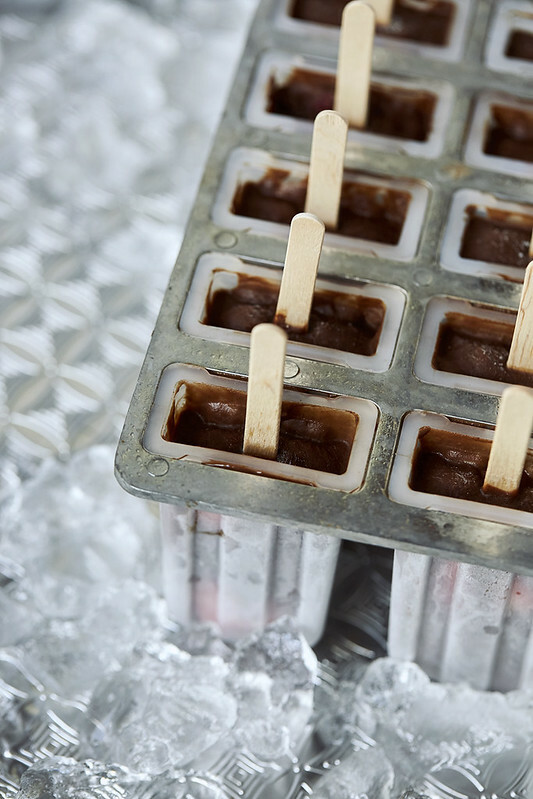 Pour or spoon the fudgesicle mixture into the molds. Tap the molds on the countertop a handful of times once they are full, to try to get rid of all the air bubbles. Add the sticks. Freeze for at least 4 hours or until totally frozen, or preferably just overnight. 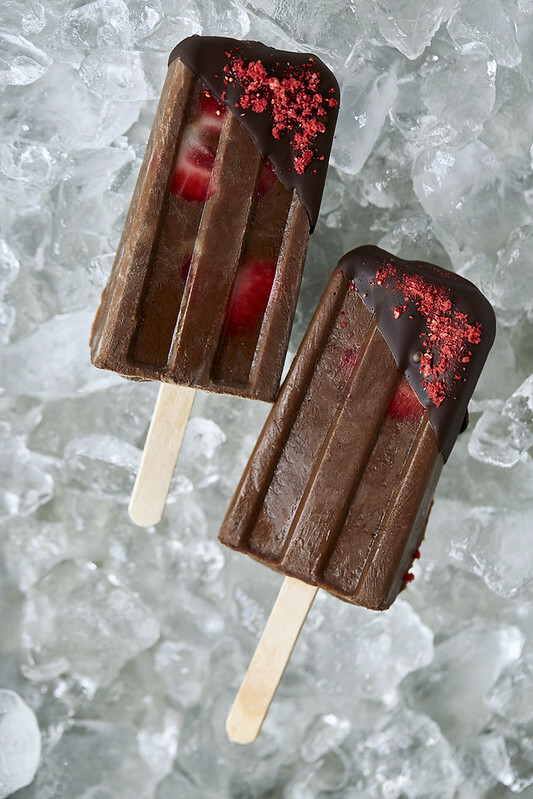 To decorate, melt the dark chocolate and set aside for it to cool down a bit. Meanwhile, in a blender, coffee or spice grinder or in a mortar and pestle, grind the dehydrated strawberries into a dust. 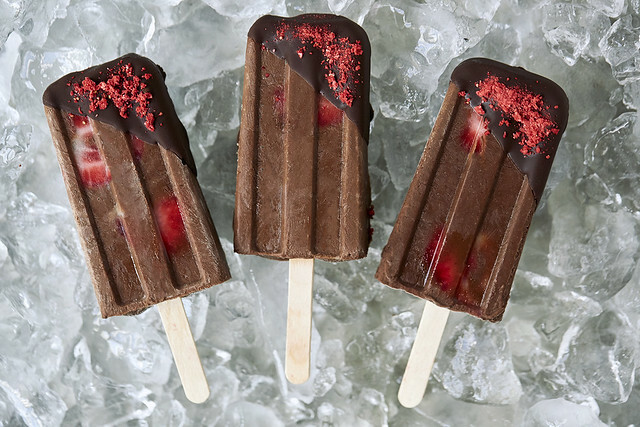 Dip the frozen popsicles into the melted dark chocolate and sprinkle with a little strawberry dust. Enjoy immediately. if the dates are very hard, soak them ahead of time. add more milk as needed, if the mixture is too thick. feel free to adjust the sweetness level to your liking. I find 6 dates to be sweet enough, personally. You can also add a small amount of raw honey, maple syrup or stevia, to taste. Dole Fresh Fruit and Fresh Vegetables is a sponsor of Tasty Yummies. All content, ideas, and words are my own. Thanks for supporting the sponsors that allow me to create new and special content like this for Tasty Yummies. My nieces and nephews are vehemently against veggies (sadly), so the only hope for getting them to consume anything healthy is to hide it. 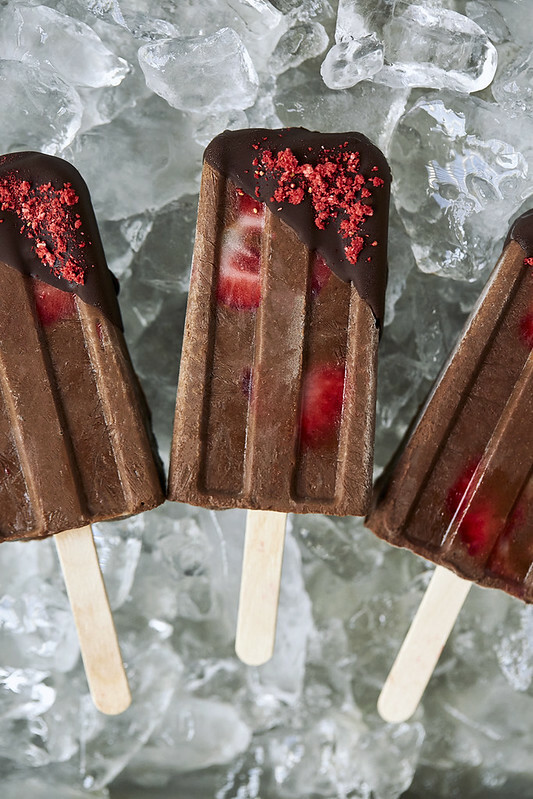 I’m LOVING the idea of adding cauliflower to these healthy popsicles! I bet they’re so creamy and decadent. 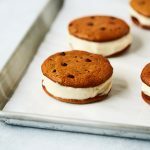 Definitely need to make these for the next kid’s bday party! OMG!!! I can’t wait to sneak these tasty ingredients into a fugesicle and watch my stepsons eat them. I know I’ll have a satisfied grin ear to ear knowing what’s in them and they will be none the wiser (my hubby too)!!! can we talk about that sheet pan though 😛 so pretty! Hi, this looks great and I can’t wait to try it. Do you happen to have the nutritional breakdown for these? Thanks. 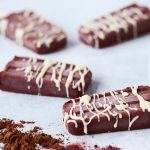 I don’t share nutritional facts and macro counts for my recipes, but it’s very simple to plug the ingredients into any number of the free nutritional calculators online and get the results very quickly. Thank you.